Deep Pyoderma in dogs is one of the most common canine bacterial infections and can often occur as a result of another disease that has previously infected the animal and damaged the health of the skin. Bacteria is always on a dogs skin and more often than not isn't a problem. Issues arise when the bacteria penetrates the skin because this causes infections such as reddened skin, rashes and can also make the skin ooze fluid. These canine bacterial infections can be very painful for the dog and can cause abscesses on the skin. For more information about these kinds of issues see our page on Dogs Skin Problems. The obvious symptom is that dogs will experience acute irritation and itchiness. This will cause the dog to scratch excessively. Unfortunately this understandable reaction causes the infection to spread to previously unaffected areas of skin. The dog biting reddened areas of his own skin is another very obvious sign that he is in distress and should be taken to the vet. As we mentioned earlier the Pyoderma is usually caused by another infection so both infections need to be treated. The problem here is in diagnosing the original problem. If that isn't sorted out than the Pyoderma will return. The vet will probably take swabs from the infected areas to try and isolate the root cause of the condition. Treatment of the disease can be a fairly long process with antibiotics been prescribed for possibly two to three months. It may also be necessary to bathe the dog with medicated shampoos over the same period. 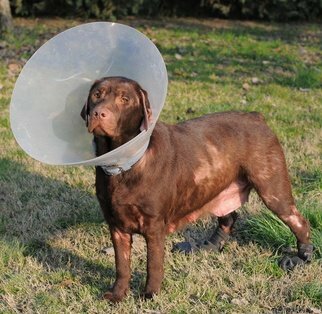 If there can be a bright spot in all of this it is that the disease itself is very common which has enabled effective medication to be developed to help the dog make a full recovery. With similar symptoms to Deep Pyoderma there is another strand of the disease known as skin fold Pyoderma. This will not usually affect Labrador Retrievers as it occurs in breeds such as Pugs that have folds in their skin. The infection affects the folds of skin on the dogs face and can be very serious with the skin needing to be removed. One of the canine bacterial infections that can be a problem for Labradors is Pododermatitis. This is a very unpleasant disease that can occur in a dogs feet. It can cause lameness and make the dogs nails fall out. Look out for sores developing on the pads of your dogs feet and between its toes. if you notice these kind of problems than it is likely that the animal will require a course of antibiotics from the vet along with regular medicated foot washes.